Strange flying-saucer-shaped moons embedded in Saturn’s rings have baffled scientists studying images transmitted by the ESA’s Cassini Spacecraft. Research suggests that the oddly shaped moons, Pan and Atlas, are born largely from clumps of icy particles in the rings themselves, a discovery that could shed light on how Earth and other planets formed from the disk of matter that once surrounded our newborn sun. 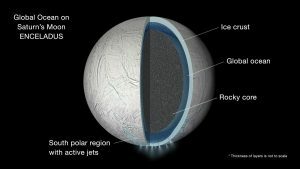 Observations by NASA’s Cassini spacecraft revealed the moons Atlas and Pan, each roughly 12 miles (20 kilometers) from pole to pole, have massive ridges bulging from their equators some 3.7 to 6.5 miles (6 to 10.5 kilometers) high, giving them the classic Earthly UFO appearance.